If you're looking for a brand-new pair of brogues, buckle-ups or just a sturdy sets of walking boots, we've got you covered. These British-made, hand-crafted shoes are from some of the top bootmakers in the country. Each with a storied history and age old techniques, you won't find a better quality pair anywhere else. Boot production has long since been a staple of towns in the UK, even now there are lots of small family businesses producing high-quality footwear using the classic methods. 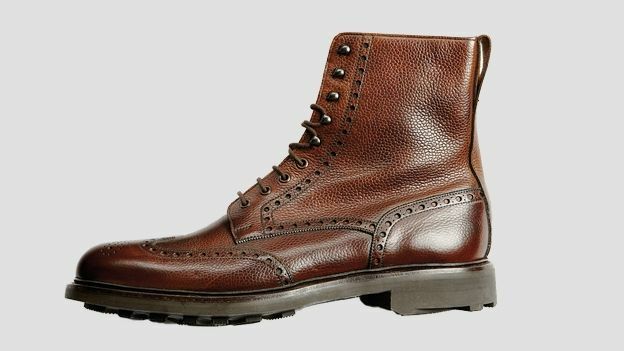 The most popular technique is the Goodyear Welt, which puts a strip of leather to bind the boot's upper to the insole, allowing the sole to be removed without damage. Particularly strong and leading to hard wearing boots, it's no surprise this has become so popular. A much more modern method is cementing - the boot's layers are stuck together using adhesive for a more light and flexible finish. James Bond's footwear of choice takes 200 separate methods to create, a process that takes up to eight weeks. See those holes? They've each been meticulously punched by hand. Does your footwear meet with the full approval of the Queen? These classic boots do. Fully lined with leather forplushness inside as well as out, they're hand crafted in eight steps, from cutting to trimming and dressing. These dapper brogues are built to last using the Goodyear Welting technique, a 100 year-old method of construction that's still the gold standard today. The sole is slightly thicker than normal for added comfort and stature. This 170 year-old firm likes to do things properly, starting by making an exhaustively accurate “last” of your foot to ensure a perfect fit, then taking up to eight months to craft your footwear. Short on time? They also do ready-to-wear versions, such as this jodhpur style riding boot. provides a very sturdy fit and a pleasing pilgrim-chic look. Aside from the Silverstone race track, Northamptonshire's main claim to fame is an illustrious history of boot making. These Country Boots feature Dainite rubber sole and part almond grain leather, part maraca suede upper. A fur lining keeps feet warm and cosy when traipsing across the moors. Why not pair one of these with a best backpack and laptop bag, or go a bit sporty with a pair of best running shoes.